The HP ProBook 4525s is a solidly built laptop with some excellent features for the price, but suffers from a single infuriating flaw that tarnishes the overall package. The all-black chassis is suitably solid, with a sleek metallic finish to the lid and plastic interior. It's a smart, fingerprint and smudge-resistant design and we noticed only a little flex on the main panels. While the 2.6kg chassis is similar in build and weight to other laptops, this is still a highly portable laptop thanks to the 247-minute battery. Over four hours of use from a single charge is easily enough to keep you working on the daily commute. The 15.6-inch screen is reasonably bright and has the same resolution as most other laptops at this price, so images appear crisp. This anti-glare screen can be comfortably used outdoors and is surprisingly vibrant, despite lacking a glossy coating. Respectable performance from the AMD Turion II processor means you can comfortably browse the web, fiddle with your spreadsheets and listen to music at the same time. In our benchmarking tests, the HP matched the Samsung R530-JA02UK, and was only comfortably beaten by the Lenovo IdeaPad Z560. An integrated ATi graphics card is also included and the HP has enough power to run high-definition video and older games, as well as the latest photo and video-editing suites. Again, only the Lenovo has more graphical power. This laptop also has some excellent features not often found elsewhere at this price. An integrated fingerprint scanner boosts security, while a spill-resistant keyboard is employed. However, much like the PC NextDay ZooStorm 3389-9209/B, usability is this laptop's Achilles' heel. Although the keyboard is well sized and comfortable to type on, despite a spongy feel and cheap look, the touchpad is infuriating as the mouse buttons have been integrated into the pad itself. Highlighting text or selecting a menu option is a battle of nerves, as the cursor often skips unpredictably when the buttons are pushed. To compound the problem, we often found ourselves brushing the pad accidentally, which again causes the cursor to skip. At 250GB, storage is enough to suit most users, but is a bit miserly for the price. However, plenty of ports are on offer, including eSATA and HDMI connections for connecting to external storage devices and HDTV's and monitor's. 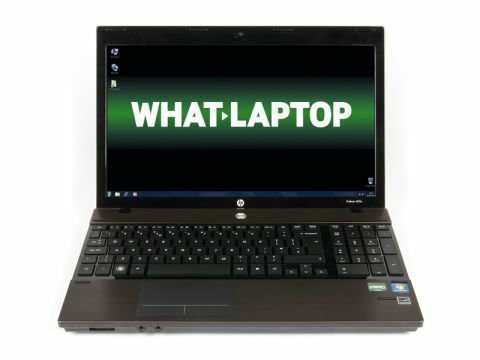 The HP ProBook 4525s has some great features and performs well, and we could have genuinely recommended it. However, the touchpad is one of the worst we have experienced and raised our blood pressure considerably.